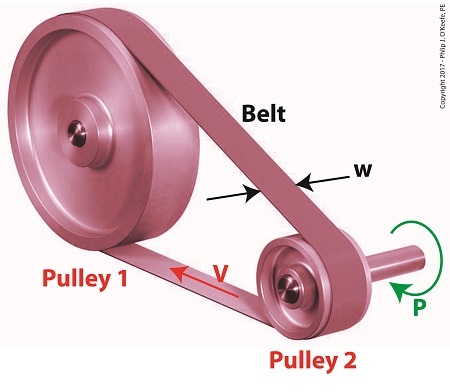 It’s been awhile since we began our discussion of a pulley-belt assembly operating within a hydroponics plant, and we’ve solved for a lot variables and derived many equations along the way. Today we’ll tackle the two remaining variables, T1 , the belt’s tight side tension, and T2 , its loose side tension, and we’ll determine exactly what belt width will optimize power transmission within our system. This equation will allow us to solve for T1 and T2, and from there we’ll develop a value for the optimum belt width. We can use a belt of minimum width of 3.22 inches to safely transmit 4 horsepower from the engine to the pump without incurring breakage and slippage along the belt, thereby optimizing power transmission within our assembly. If we used a narrower belt, breaking and slippage would occur. If we used a wider belt, an unnecessary expense would be incurred. Next time we’ll begin a discussion on flywheels as they apply to rotating machinery like gasoline and steam engines.